U.S. District Court Judge James A. Redden this week notified lawyers in the Northwest's biggest salmon case that he'll step down before 2014, when another court-ordered plan for salmon and Columbia Basin dam operations is due. Redden, 82, has rejected three federal government plans for operating hydropower dams on the Columbia and Snake rivers without causing undue harm to salmon and steelhead on the endangered species list. In August, the Portland-based judge rejected the government's "biological opinion" for the third time, ordering the National Oceanic and Atmospheric Administration to submit a new plan no later than Jan. 1, 2014. 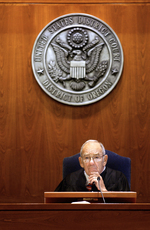 Federal Judge James A. Redden to Step Down after a Decade on the Northwest's Biggest Salmon Lawsuit <-- Full article available at original site.